WITNESS THIS AMENDED AND RESTATED DECLARATION OF PROTECTIVE COVENANTS, RESERVATIONS, RESTRICTIONS, AND COMMON EASEMENTS, made this 21st day of November, 2017, by Criterion Development, LLC, with an address of P.O. Box 50, Bridgton, Maine 04009, hereinafter referred to as the “Declarant”. WHEREAS, the Declarant desires to create a residential area of Cottages At Willet Brook Development providing for the greatest possible degree of health, safety, environmental beauty, and amenity for the property owners and inhabitants thereof, and to effect the foregoing purposes, desires to subject the property to protective covenants and common easements and to the provisions for a homeowners association for the administration and enforcement of same, the maintenance and improvement of certain common facilities, and the establishment, collection and disbursement of assessments, all as set forth hereinafter, each and all of which are for the benefit of the property and of each lot of the protective covenants and easements hereinafter set forth, maintaining and improving certain rights-of-way and other common facilities, and otherwise carrying out the functions of a homeowners association and the provisions and objectives ofthis Declaration. NOW, THEREFORE, Declarant hereby declares that the property shall be held, occupied, improved, transferred, sold, leased, and conveyed subject to the protective covenants and restrictions, the reservations and exceptions, the common rights and easements, and the provisions of a homeowners association hereinafter set forth, all of which are declared to be in furtherance of a uniform scheme for the development of the property and that said protective covenants, reservations, common easements, and provisions for a homeowners association are intended to enhance and protect the value and desirability of the property as a whole, to mutually benefit each of the parcels located thereon, to create mutual, equitable servitudes upon each of the parcels in favor of each and all other parcels therein and to create reciprocal rights and privities of contract and estate between all persons acquiring or owning any interest in any portion of the property including Declarant, and Declarant’s grantees, successors, administrators, and assigns and shall be deemed to run with the land and be a burden and benefit to and enforceable by all such persons, including Declarant, and Declarant’s grantees, successors, administrators, and assigns, and by the homeowners association. a. Road. All roads and ways as shown on the Plans. b. Association. The homeowners association named Cottages At Willett Brook Association, Inc., which Declarant has organized as a nonprofit corporation for the purpose of administering and enforcing the protective covenants and easements hereinafter set forth, maintaining and improving certain rights-of-way and other common facilities, and otherwise carrying out the functions of a homeowners association and the provisions and objectives of this Declaration. c. Declarant. Criterion Development, LLC, as aforesaid, and any successor to all of Declarant’s right, title, and interest in and to the property. d. Owner. The record owner, whether one or more persons or entities, of the fee simple title to any lot or parcel, but not including Declarant. e. Lot or Parcel. Any one of the numbered lots within the property as shown upon the Plans, which may hereafter be conveyed by Declarant. f. Plans. That Plan labeled “Cottages At Willett Brook,” dated August 28, 2014, approved by the Planning Board of the Town of Bridgton, Maine, on September 4, 2014, and recorded in the Cumberland County Registry of Deeds in Plan Book 214, Pages 329 through 333 inclusive, as amended by Plan of “Cottages at Willett Brook” dated August 28, 2014, approved by the Town of Bridgton Planning Board on December 2, 2014, and recorded in the Cumberland County Registry of Deeds in Plan Book 214, Pages 493 through 497 inclusive, as amended by Plan of “Revised “B” Street Lots” dated July 17, 2015, last revised October 2, 2015, approved by the Planning Board of the Town of Bridgton, Maine, on October 6, 2015, and recorded in the Cumberland County Registry of Deeds in Plan Book 215, Page 449, as amended by Plan of “Second Revised ‘B’ Street Lots The Cottages Bridgton, Maine” dated July 17, 2015, approved by the Planning Board of the Town of Bridgton, Maine on December 15, 2015, and recorded in the Cumberland County Registry of Deeds in Plan Book 215, Page 512, as amended by Plan of “Revised Plan of “C” & “D” Street Cottages at Willett Brook Bridgton, Maine” dated August 13, 2014, approved by the Planning Board of the Town of Bridgton, Maine, on November 1, 2016, and recorded in the Cumberland County Registry of Deeds in Plan Book 216, Page 498, as amended by Plan of “Revised E Street & Journey’s Path Lots Cottages at Willett Brook Bridgton, Maine” dated August 13, 2014, approved by the Planning Board of the Town of Bridgton, Maine on November 1, 2016, and recorded in the Cumberland County Registry of Deeds in Plan Book 216, Page 499, as amended by Plan of “Revised ‘D’ Street – 10 Lots, Cottages at Willett Brook, Bridgton, Maine” prepared by Sawyer Engineering & Surveying, Inc. dated July 17, 2015, approved by the Town of Bridgton Planning Board on September 5, 2017, and recorded in the Cumberland County Registry of Deeds in Plan Book 217, Page 421, as amended by Plan of “Revised Journey’s Path – 10 Lots, Cottages at Willett Brook Bridgton, Maine” prepared by Sawyer Engineering & Surveying, Inc. dated July 17, 2015, approved by the Town of Bridgton Planning Board on September 5, 2017, and recorded in the Cumberland County Registry of Deeds in Plan Book 217, Page 422 (hereinafter collectively, the “Plans”). Declarant reserves the right to amend the Plans to allow for lot line adjustments and varying lot sizes. This Declaration may be amended from time to time by Supplemental Declarations duly executed by Declarant, and provided Declarant owns at least a majority of the Lots designated on the Plans, the Declarant may solely amend this Declaration or any Supplemental Declaration, or by the Cottages At Willett Brook Association, Inc. pursuant to a vote of the owners in accordance with the Bylaws of the Cottages At Willett Brook Association, Inc. and recorded in the Cumberland County Registry of Deeds. No such amendment shall render invalid any use of subdivision land within the property existing in accordance with this Declaration at the time of recording such Supplemental Declaration, and any such amendment shall be reasonably consistent with the uniform scheme of development established by this Declaration. a. Road. A right-of-way for all purposes over, across and through the Road, together with the right to install and maintain utility poles and lines and water and sewer lines and drainage areas adjacent to, within or under the traveled portion of said roads. b. Common Areas. The right of access to, across, and through the common areas as shown on the Plans. c. Utilities. Declarant reserves a perpetual easement and right, appurtenant to all Lots in the Cottages At Willett Brook subdivision as shown on the Plans, over, under and across all Lots and Roads, to erect, construct, maintain, protect and operate overhead and underground wires, cables, poles, conduits and apparatus for the transmission of electrical energy, telephone lines, water and gas, and for the installation, maintenance, repair and replacement of subsurface sewage and wastewater disposal systems including but not limited to subsurface sewage disposal fields, treatment tanks and associated piping, or for other utility service. The location of the easement shall be as first constructed on the face of the earth with sufficient area surrounding each utility component to allow for maintenance, repair and replacement. Promptly after any disturbance to the ground in the exercise of these easement rights, the surface of the ground shall be restored to substantially the same condition as it was in prior to such disturbance. No permanent structures, landscaping walls or fences shall be permitted in the easement areas. The Owners agree to execute any instruments necessary to grant easements in fee to any public utility company required for the Declarant’ s exercise of any rights relative to the aforementioned utility services. d. Other. The right to exercise throughout the property any rights or powers hereinafter conferred upon the Association by amended Declaration. e. Declarant’s Remaining Lands. Irrespective of Declarant’s sale of any portion or all of the numbered parcels, Declarant reserves an easement and right-of-way over, across and through the Road for ingress and egress to Declarant’ s remaining lands as shown on the Plans. Such easement shall be for all purposes, including the right to install, operate and maintain above-ground or underground utilities along the Road, for the benefit of and appurtenant to Declarant’s remaining lands. a. Access. A right-of-way for all purposes over and along the Road, in the subdivision, as shown on the Plans, in common with Declarant and in common with the owners of the other parcels, and subject to those rights, privileges, reservations and restrictions pertaining to the Road as more particularly set forth in a deed to the Declarant dated October 10, 2014 and recorded in the Cumberland County Registry of Deeds in Book 31844, Page 117.
b. Common Areas. A right of reasonable use of the common areas, including any and all areas, for purposes of passive and active recreation, provided that no improvements shall be made except as authorized by the Planning Board of the Town of Bridgton. The Declarant and the Association shall have the power and duty to set rules and regulations concerning the use of said common area, if any. a. Residential Use. No parcel shall be improved or used except for private single family residential purposes, with no more than one principal residence and improvements accessory thereto. All houses shall be erected with a continuous foundation and shall include a heating system for year-round occupancy. No Lot, nor any part of it, shall be used for any commercial purposes. b. Occupancy Restrictions. The Cottages At Willett Brook Development shall be subject to an “Age 55 or Older” covenant pursuant to the U.S. Housing for Older Persons Act of 1995 (42 U.S.C.§3601 et seq. ), and the Maine Human Rights Act (5 M.R.S.A. §4581) and the regulations adopted pursuant thereto (the “Legal Requirements”), whereby the occupied Lots must at all times be occupied by at least one (1) Permanent Resident who is 55 years of age or older (a “Qualified Resident”) during the time a Lot is occupied, provided however that in the event of the death or divorce of the person who was the sole Qualified Resident, then the surviving spouse or any other resident of the Lot at the time of death or divorce may remain in occupancy so long as not more than 20% of the Lots are so occupied as further set forth in the Legal Requirements. A “Permanent Resident” is a person who occupies the Lot for at least six (6) months of the year, or such s]:iorter period as a unit is actually occupied. The Association shall adhere to policies and procedures that demonstrate the intent required to provide housing for older persons and the Association shall comply with rules issued by the Secretary of Housing and Urban Development and the Maine Human Rights Commission for verification of the age 55 occupancy. Each resident is required to cooperate in demonstrating compliance with the foregoing residency restrictions. Children under the age of 18 may visit but may not become an occupant. A person will be deemed an occupant of a Lot if he or she stays overnight in the Lot for more than 7 days in any calendar year. These provisions shall restrict occupancy and not ownership of a Lot. Every lease or sales contract shall prominently disclose the foregoing occupancy restriction. Failure to comply with the foregoing requirements shall be an event of default under the lease. The Association may adopt rules and regulations implementing and interpreting the foregoing requirements, including waivers to the foregoing requirements, provided that at least eighty percent (80%) of the Lots are occupied by Qualified Residents. Homes may be rented to persons age 55 years of age or older for a minimum of one month and up to four times per year. All renters must be approved by the Association and a lease must be submitted to the Association prior to the start of the rental period. c. Prohibition on Subdividing Land. No Lot or Parcel shall be divided or subdivided except for the purpose of conveying portions of a single lot to abutting lot owners for the purpose of increasing the lot size of said abutting lot owners or to correct boundary line locations. d. Road Maintenance. The Declarant shall construct the roadways designated on the Plans in accordance with the Plans and specifications approved by the Planning Board for the Town of Bridgton. Thereafter, the Association shall have the right, duty, and obligation to maintain the roadways, subject to those rights, privileges, reservations and exclusions pertaining to Courtyard Circle, so-called, as set forth in a deed to the Declarant dated October 10, 2014 and recorded in the Cumberland County Registry of Deeds in Book 31844, Page 117.
e. Snow Removal. Snow removal costs shall be divided fairly and equally by and paid by all inhabitants for the pending winter season as of October 1st. An inhabitant is defined as a homeowner, lot owner, or builder planning to use the road for the winter season. All money is due by October 15th each year payable to the snow contract coordinator. Notwithstanding any forgoing provisions regarding the allocation of expenses, if any maintenance or repair of the road is necessitated by the act of any owner (present or Future) of a lot accessed by these roads or by the act of any such owners employees, guests, invitees, contractors, or agents, and such maintenance or repair is not due to normal wear and tear of roadways and is not due to a defective condition of the roadway, the costs of such maintenance and repair shall be borne solely by such owner. Specifically and not by way of limitation , if during the period of construction on a lot, the roadway is damaged because of construction vehicles on such lot, then the cost of repairing such damage shall be borne solely by the owner of such lot. f. Design of Dwelling. The design of residential dwelling and other acceptable buildings, including, but not limited to, materials, colors, textures, building shape, rooflines, window treatment, and site orientation shall be of a character harmonious with the natural beauty of the Cottages At Willett Brook Development environment. On all lots the principle residence to be build must have at least 604 square feet of habitable space. Basements, garages, carports, porches (screened or otherwise) sloops, and terraces do not count as habitable space. There will be no trailers or mobile homes allowed. All houses shall be erected with a continuous foundation and shall include a heating system for year-round occupancy. Garbage disposals are prohibited. When any building elements need to be replaced, materials of similar size, color and style shall be used. In the event of destruction of a dwelling, the dwelling shall be rebuilt using the original plans and, to the extent possible, the same window sizes and type of materials as the original dwelling. No more than one principal dwelling unit shall be permitted at any time on the Lot, exclusive of auxiliary structures such as a garage or storage building. No modifications to the exterior of the home are permitted without a written request from the Owner and without prior written approval from the Declarant so long as the Declarant owns a lot in the Cottages At Willett Brook Development; thereafter, exterior modifications shall require approval of the Association. g. Maintenance. All parcels, including the common areas and walking trails, shall be maintained in a neat, attractive manner and kept in good repair. Every domestic water supply system and sewage disposal system shall be kept and maintained in compliance with all federal, state, and local requirements and in compliance with the provisions of this Declaration. h. Exteriors. Propane tanks shall not be visible from the road which fronts the dwelling. No clotheslines are permitted. Any additional landscaping on any lot shall require the approval of the Declarant so long as the Declarant owns a lot in the Cottages At Willett Brook Development; thereafter, exterior modifications shall require approval of the Association. Screen doors not installed by the Declarant shall require the approval of the Declarant so long as the Declarant owns a lot in the Cottages at Willett Brook Development; thereafter, approval of the Association shall be required. The property shall be kept in a neat appearance and maintained. No disabled or unregistered vehicles, junk or debris shall be stored or kept in open view on the property. Exterior flags shall not be permitted on the Lot or Common Areas. A small 1Ox10 garden, small deck, or small patio is permitted on a Lot in the rear of the home, however, design and location approval from the Declarant is required, so long as Declaration owns a Lot in the Cottages at Willett Brook Development. House trailers, camping trailers or mobile homes, so-called, whether on wheels or not, and tents used for occupancy shall not be permitted on a Lot. I. Surface Water. No owner of a lot, his agents, or successors in interest shall alter the natural course of surface water on any lot in a way which would alter the natural flow of such water across any other parcel, unless such alteration is approved by the owners of all parcels affected. J. Compliance with Ordinances. All construction activities, including the siting of buildings, septic systems, and water supply shall be in accordance with all local, state, and federal laws, codes, ordinances, and regulations. k. Animals. No animal husbandry shall be housed or kept on the property, provided, however, that this shall not exclude common household pets. If an Owner chooses to have a common household pet, there is a two pet maximum with a sixty-five pound limit for each pet. Pit bulls, Rottweilers and German Shepards are not permitted, including visiting dogs. All pet waste, must be picked-up from the Lot or Common Areas and disposed of properly. 1. Siding and Roofs. No dwelling or other building erected on any lot will be covered with tar paper, asphalt siding, or corrugated metal siding but shall be covered with clapboards, shingles or other suitable material. Roofs of all buildings erected on any lot shall be pitched. The installation of shutters shall require the approval of the Declarant so long as the Declarant owns a lot in the development; thereafter, shutters shall require the approval of the Association. m. Trash. Trash, garbage, and other waste shall be kept in sanitary containers where they are not visible from the road or any other parcel. All garbage and trash must be placed in the proper receptacles designated for refuse collection and no garbage or trash shall be placed elsewhere on the Lot. However, if an Owner chooses to obtain private trash pick­ up service, trash may be placed on the curbside in proper receptacles no sooner than the morning of the pickup. n. Tree Cutting. Any cutting of trees shall be done in compliance with the Plans. This section shall not preclude the removal of diseased or naturally damaged trees. There shall be no clearing of trees or vegetation within twenty-five (25) feet of the Lot lines. o. Completion of Construction. Any construction, including landscaping, commenced on any lot shall be completed within a period of 12 months from the date construction originally commenced. The Association shall have the right to set, assess, and levy fines for violation of this section. p. Unregistered Motor Vehicles. No unregistered motor vehicles may be kept outside on any Lot, but may be stored in a garage. No house trailer, business or commercial vehicle, or vehicle of similar nature shall be brought upon, or be maintained, or be permitted to remain on the Lot except a business vehicle normally used by a lot owner in his or her occupation may remain on the Lot provided said vehicle is parked in an enclosed garage. Spaces in the RV/Boat storage area are available on a first come, first serve basis. No owner shall occupy more than one space without approval of the Association. q. Tractor Trailers. No tractor trailers may be kept on any Lot. r. Signs. “For Sale” signs no larger than 18″ X 24″ shall be permitted on any lot or home. This size restriction shall not apply to the Declarant. s. Clubhouse. The Clubhouse may be reserved on a first come first serve basis, scheduled at least one week in advance on the calendar located in the mailroom. The Clubhouse must be thoroughly cleaned and replenished after its use. u. Compliance with Stormwater Management Report. 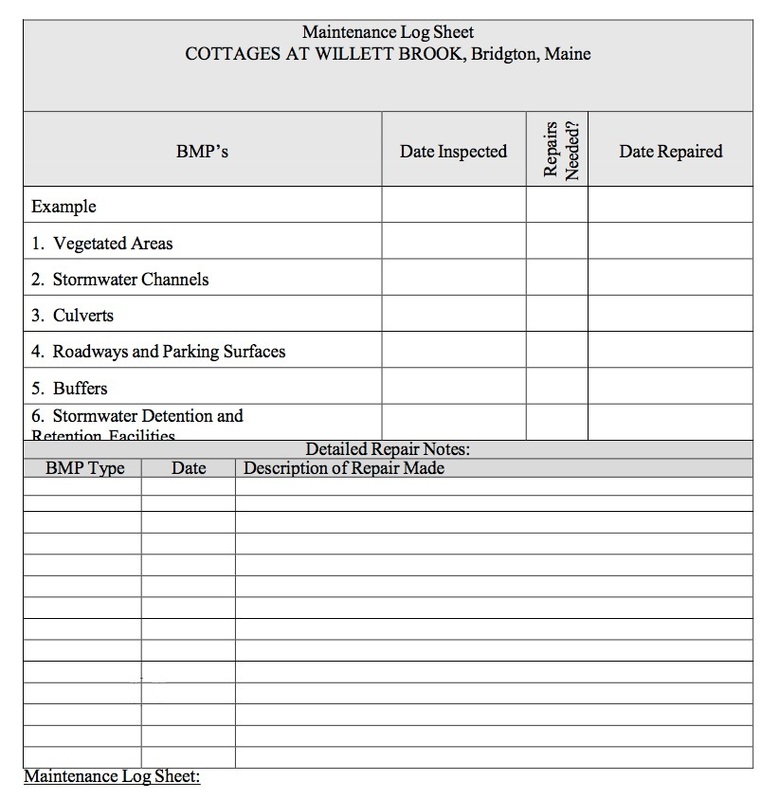 The Cottages At Willet Brook Development shall comply with the maintenance requirements of the Stormwater Management System in accordance with the Stormwater Management Report approved by the Maine Department of Environmental Protection. The owner of the Cottages At Willett Brook Development is GiterionDevelopment, LLC. The owner’s address is P.O. Box 50, Bridgton, Maine. The maintenance of the stormwater management structures will be the responsibility of the owner. Until that time, the Declarant will assure that the following maintenance plan is adhered to. The owner or operator of the proposed project will be responsible for the maintenance of all stormwater management structures, the establishment of any contract services required to implement the program, and the keeping of records and maintenance log book. Records of all inspections and maintenance work accomplished must be kept on file and retained for a minimum 5 year time span. The maintenance log book will be made available to the DEP upon request. At a minimum, the appropriate and relevant activities for each of the stormwater management systems will be performed on the prescribed schedule. NOTE: The following instruction are excerpts from the Maine Department of Environmental Protection’s Stormwater Management for Maine, Volume III BMPs Technical Design Manual, dated January 2006. 1. Mowing: Grass should not be trimmed extremely short, as this will reduce the filtering effect of the swale (MPCA, 1989). The cut vegetation should be removed to prevent the decaying organic litter from adding pollutants to the discharge from the swale. The mowed height of the grass should be 2-4 inches taller than the maximum flow depth of the design water quality storm. A minimum mow height of 6 inches is generally recommended (Galli, 1993). 2. Routine Maintenance and Inspection: The area should be inspected for failures following heavy rainfall and repaired as necessary for newly formed channels or gullies, reseeding/ sodding of bare spots, removal of trash, leaves and/or accumulated sediments, the control of woody or other undesirable vegetation and to check the condition and integrity of the check dams. 3. Aeration: The buffer strip may require periodic mechanical aeration to restore infiltration capacity. This aeration must be done during a time when the area can be reseeded and mulched prior to any significant rainfall. 4. Erosion: It is important to install erosion and sediment control measures to stabilize this area as soon as possible and to retain any organic matter in the bottom of the trench. 5. Fertilization: Routine fertilization and/or use of pesticides is strongly discouraged. If complete re-seeding is necessary, half the original recommended rate of fertilizer should be applied with a full rate of seed. 6. Sediment Removal: The level of sediment deposition in the channel should be monitored regularly, and removed from grassed channels before permanent damage is done to the grassed vegetation, or if infiltration times are longer than 12 hours. Sediment should be removed from riprap channels when it reduces the capacity of the channel. Paved surfaces shall be swept or vacuumed at least twice annually in the Spring to remove all Winter sand, and periodically during the year on an as-needed basis to minimize transportation of sediment during rainfall events. 7. Level Spreader Replacement: The reconstruction of the level spreader may be necessary when sheet flow from the spreader becomes channeled into the buffer. 1. Inspect resource and treatment buffers at least once a year for evidence of erosion, concentrating flow, and encroachment by development. 2. Management of a buffer’s vegetation must be consistent with the requirements in any deed restrictions for the buffers. 3. Wooded buffers must remain fully wooded and have no disturbance to the duff layer. 4. Vegetation in non-wooded buffers must be cut no more than three times per year and no shorter than six inches. 5. Erosion within a buffer must be repaired as soon as practicable. If flows are concentrating within the buffer, site grading, level spreaders, or ditch tum-outs must be used to ensure a more even distribution of flow into the buffer. 6. Check downslope of all spreaders and tum-outs for erosion. If erosion is present, adjust or modify the spreader’s or turnout’s lip to ensure a better distribution of flow into the buffer. 7. Clean-out any accumulation of sediment within the spreader bays or tum-out pools. 1. A legal entity should be established with responsibility for inspecting and maintaining any underdrained filter. The legal agreement establishing the entity should list specific maintenance responsibilities (including timetables) and provide for the funding to cover long-term inspection and maintenance. 2. Inspect the embankments for settlement, slope erosion, internal piping, and downstream swamping. A professional engineer must review these immediately. 3. Mow the embankment to control woody vegetation. 4. Inspect the outlet control structure for broken seals, obstructed orifices, and plugged trash racks. 5. Remove and dispose of sediments and debris within the control structure. 6. Repair any damage to trash racks or debris guards. 7. Mow vegetated spillways to control woody vegetation and replace any dislodged stone in riprap spillways. 8. Remove and dispose of accumulated sediments within the impoundment and forebay. The owner of each parcel within the property, or his heirs, successors, or assigns, shall automatically, during the period of his ownership and by virtue of said ownership, be a member of the Association so long as he retains title to any parcel on the Plans. a. Purposes. The purposes of the Association shall be the operation and maintenance of the roads in the subdivision, common drives, the dry hydrants servicing the subdivision, and any other common facilities of limited or general use located within the common areas; the administration and enforcement of the protective covenants and easements set forth in this Declaration; the general protection of the property; and the performance of any functions relating to the use, maintenance, or improvement of the property required by this Declaration or which may be approved by vote of the Owners. b. Bylaws. The Association shall be organized and operated pursuant to the Bylaws of Cottages At Willett Brook Association, Inc., as amended from time to time by the Association. A copy of the Bylaws is attached hereto as Exhibit A.
c. Voting. Each owner, by virtue of his ownership of a parcel, shall automatically be entitled to the votes as provided for in the Bylaws of the Association. 1. Each owner shall be assessed by the Association, at least annually, a fee covering his share of the net costs of carrying out the functions and purposes of the Association. The fees shall be computed and collected by the Association and are due and payable on the first day of each quarter, unless otherwise specified by the Association. The collection of the assessments maybe made in advance and limited reserves may be maintained in order to ensure that the purposes and obligations of the Association are carried out in a timely manner. 11. Such assessments as collected by the Association shall include any municipal taxes as charged against the common areas or the roads. Each owner shall pay a share of such tax proportionate to the number of parcels owned by him. 111. Such assessments, together with interest thereon, and cost of collection shall be charged upon each parcel of the owner against whom each assessment is made. If any assessment is not paid when stated to be due, then such assessment shall become delinquent. If the assessment is not paid within thirty (30) days after the due date, the assessment shall bear interest at the rate of eighteen (18) percent per annum from the due date and any owner or owners, or the Association, may have a lien against the lot so assessed which may be enforced in the same manner and with the same force and effect as a lien filed pursuant to 14 M.R.S. §4651-A et seq. The lien shall include interest on the assessment as above provided and reasonable attorney’s fees and any costs of suit incurred in the enforcement or collection of any assessment. 1v. Upon the purchase of a Lot, the purchaser shall pay the equivalent sum of two months of Association assessments as an initial fee to the Association. v. Declarant shall not be obligated to pay assessments on unsold lots or homes, provided, however, that Declarant shall pay a proportionate share of landscape maintenance and snow removal. Such share will be based on a percentage of unsold lots to those lots sold and being plowed and maintained. e. Road Maintenance Requirements. Subject to subject to those rights, privileges, reservations and restrictions pertaining to the Road as more particularly set forth in a deed to the Declarant dated October 10, 2014 and recorded in the Cumberland County Registry of Deeds in Book 31844, Page 117, the Road shall be repaired and maintained to safe and passable standards for two wheel drive vehicles. The Road shall be kept in at least the condition established by the Town of Bridgton pursuant to its approvals of the Cottages At Willett Brook Development, such plans being on file with the Town of Bridgton. The name of the corporation is COTTAGES AT WILLETT BROOK ASSOCIATION, INC., hereinafter referred to as the “Association”. The principal office of the corporation shall be located at Bridgton, Maine, but meetings of Members and Directors may be held at such places within the State of Maine, as may be designated by the Board of Directors. Section 1. Membership. The Members shall consist of the Owners of all Lots depicted and shown on a plan entitled “Cottages at Willett Brook” made by Terradyn Consultants, LLC, dated August 28, 2014, and Sawyer Engineering & Surveying, Inc. dated August 13, 2014, approved by the Town of Bridgton Planning Board on September 4, 2014, and recorded in the Cumberland County Registry of Deeds in Plan Book 214, Pages 329 through 333 inclusive, as amended by Plan of “Cottages at Willett Brook” made by Terradyn Consultants, LLC, dated August 28, 2014 and Sawyer Engineering & Surveying, Inc. dated August 13, 2014, approved by the Town ofBridgtonPlanning Board on December 2, 2014, and recorded in the Cumberland County Registry of Deeds in Plan Book 214, Pages 493 through 497 inclusive (hereinafter collectively referred to as the “Plan”), being Lots governed by the Declaration of Protective Covenants, Reservations, Restrictions and Easements of Cottages At Willett Brook,. to be recorded in the Cumberland County Registry of Deeds. Membership shall be in accordance with the Declaration and with these Bylaws. The membership of each Owner ti rminates upon a sale, transfer, or other disposition of the Member’s interest in the Lot (as defined in the Declaration), whereupon the membership and any interest in the funds of the Association shall automatically transfer and be vested in the successor in ownership. A mortgage of any Lot shall not operate to transfer membership until the mortgage is foreclosed. Section 1. Annual Meetings. The first annual meeting of the Members shall be held within one (1) year from the date of incorporation of the Association, and each subsequent regular annual meeting of the Association shall be held on the first Saturday in July in each year. If the date for the annual meeting of the Members is a legal holiday, the meeting will be held at the same hour on the first day following which is not a legal holiday. Section 2. Special Meetings. Special meetings of the Members may be called at any time by the President or by the Board of Directors, or upon the written request of Members owning at least a majority of the then existing Lots in the Association, by giving at least ten (10) days notice to all Members. Notwithstanding this provision, any Member may waive receiving ten (10) days notice and accept any shorter notice. At any annual or special meeting, the presence of the Owners of not less than a majority of the then existing Lots in the Association shall constitute a quorum for all purposes. At all meetings at which a quorum is present, except as otherwise provided in the Declaration, a majority of the votes cast on matter shall control. Section 3. Notice of Meetings. Written notice of each meeting of the Members shall be given by, or at the direction of, the Secretary or person authorized to call the meeting, by mailing a copy of such notice, postage prepaid, at least ten (10) days before such meeting to each member entitled to vote, addressed to the Member=s address last appearing on the books of the Association, or supplied by such Member to the Association for the purpose of notice. Such notice shall specify the place, day, and hour of the meeting and, in the case of a special meeting, the purpose of the meeting. Section 4. Quorum. At any annual or special meeting, the presence of the Owners entitled to cast, or of proxies entitled to cast, votes for a majority of the then existing Lots in the Association shall constitute a quorum for any action except as otherwise provided in the Articles of Incorporation, the Declaration, or these Bylaws. At all meetings at which a quorum is present, except as otherwise provided in the Declaration, a majority of the votes cast (each Lot being entitled to one (1) vote) on any matter shall control. If, however, such quorum shall not be present or represented at any meeting, the Members entitled to vote shall have power to adjourn the meeting from time to time, without notice other than announcement at the meeting, until a quorum as aforesaid shall be present or be represented. Section 5. Proxies. At all meetings of Members, each member may vote in person or by proxy. All proxies shall be in writing and filed with the Secretary. Every proxy shall be revocable and shall automatically cease upon conveyance by the Member of the Member’s Lot. Section 6. Unanimous Action of the Members. Any action which may be taken at a meeting of the Members may be taken without a meeting if all of the Members sign written consents setting forth the action taken, at any time before or after the intended effective date of such action. Such consent shall be filed with the minutes of the Members’ meetings and shall have the same effect as the unanimous vote. Section 1. Number. The affairs of this Association shall be managed by a Board of Directors composed of a minimum of three (3) Directors, or such greater number of Directors, within the limits set by the Articles oflncorporation, to which the Board membership may be increased by Board action in the manner set forth in the Articles of Incorporation. Section 2. Term of Office. At the first annual meeting the Members shall elect one (1) Director for a term of one (1) year; one (1) Director for a term of two (2) years; and one (1) Director for a term of three (3) years. At each annual meeting thereafter, the Members shall elect one (1) Director for a term of three (3) years. Section 3. Removal. Any Director may be removed from the Board, with or without cause, by a vote of 2/3 of the Members of the Association. In the event of death, resignation, or removal of a Director, his or her successor shall be selected by the remaining members of the Board and shall serve for the unexpired term of his or her predecessor. Section 4. Compensation. No Director shall receive compensation for any service he or she may render to the Association. However, any Director may be reimbursed for his or her actual expenses incurred in the performance of his or her duties. Section 5. Unanimous Action of the Members of the Board of Directors. Any action which may be taken at a meeting of the Board of Directors may be taken without a meeting if all members of the Board of Directors sign written consents setting forth the action taken, at any time before or after the intended effective date of such action. Such consent shall be filed with the minutes of the meetings of the Board of Directors and shall have the same effect as the unanimous vote. Section 1. Nomination. Nomination for election to the Board ofDirectors shall be made by a Nominating Committee. Nominations may also be made from the floor at the annual meeting. The Nominating Committee shall consist of a Chairman, who shall be a member of the Board of Directors, and two or more Members of the Association. The Nominating Committee shall be appointed by the Board of Directors prior to each annual meeting of the Members, to serve from the close of such annual meeting until the close of the next annual meeting, and such appointment shall be announced at each annual meeting. The Nominating Committee shall make as many nominations for election to the Board of Directors as it shall, in its discretion, determine, but not less than the number of vacancies that are to be filled. Such nominations may be made from among Members or non-Members. Section 2. Election. Election to the Board of Directors shall be by secret ballot. At such election, the Members or their proxies may cast, in respect to each vacancy, as many votes as they are entitled to exercise under the provisions of the Declaration. The persons receiving the largest number of votes shall be elected. Cumulative voting is not permitted. Section 1. Regular Meetings. Regular meetings of the Board of Directors shall be held annually without notice, at such place and hour as may be fixed from time to time by resolution of the Board. Should any such meeting fall upon a legal holiday, then that meeting shall be held at the same time on the next day which is not a legal holiday. The first quarterly meeting each calendar year shall follow the annual meeting of the membership. Section 2. Special Meetings. Special meetings of the Board of Directors shall be called at any time by the President of the Association, or by one-third (1/ 3) of the Directors, but not less than any two (2) Directors, after not less than seven (7) days notice to each Director. (f) procure and maintain liability and hazard insurance on property owned by the Association. (g) procure and maintain, to the extent reasonably available, hazard insurance on property owned by the Corporation, and liability insurance in the name of the Corporation and on behalf of any person who is or was a director, officer, employee or agent of the Corporation. Section 1. Enumeration of Offices. The officers of this Association shall be a President and, at the option of the Directors, a Vice President, who shall, at all times, be members of the Board of Directors, a Secretary, and a Treasurer, and such other officers as the Board may from time to time by resolution create. Section 3. Term. The officers of this Association shall he elected annually by the Board and each shall hold office for one (1) year unless he or she shall sooner resign or be removed or otherwise disqualified to serve. Section 4. Special Appointments. The Board may elect such other officers as the affairs of the Association may Require, each of whom shall hold office for such period, have such authority, and perform such duties as the Chairman may, from time to time, determine. Section 5. Resignation and Removal. Any officer may he removed from office with or without cause by the Board. Any officer may resign at any time by giving written notice to the Board, the President, or the Secretary. Such resignation shall take effect on the date of receipt of such notice or at any later time specified therein and, unless otherwise specified therein, the acceptance of such resignation shall not be necessary to make it effective. Section 6. Vacancies. A vacancy in any office may be filled by appointment by the Board. The officer appointed to such vacancy shall serve for the remainder of the term of the officer he or she replaces. (a) President. The President shall preside at all meetings of the Board of Directors; shall see that orders and resolutions of the Board are carried out; shall sign all leases, mortgages, deeds, and other written instruments; and shall co-sign all checks and promissory notes. (b) Vice President. The Vice President shall act in the place and stead of the President in the event of the President’s absence, inability, or refusal to act, and shall exercise and discharge such other duties as may be required of the Vice President by the Board. (c) Secretary. The Secretary shall record the votes and keep the minutes of all meetings and proceedings of the Board and of the Members; keep the corporate seal of the Association and affix it on all papers requiring said seal; serve notice of meetings of the Board and of the Members; keep appropriate current records showing the Members of the Association together with their addresses; and shall perform such other duties as required by the Board. (d) Treasurer. The Treasurer shall receive and deposit in appropriate bank accounts all monies of the Association and shall disburse such funds as directed by resolution of the Board of Directors; shall sign all checks and promissory notes of the Association; keep proper books of account; and shall prepare an annual budget and a statement of income and expenditures to he presented to the membership at its regular annual meeting, and deliver a copy of each to the Members. Section 1. Exculpation. No Director or officer of the Association shall be liable for acts or defaults of any other officers or Member or for any loss sustained by the Association or any Member thereof, unless the same has resulted from his or her own willful misconduct or gross negligence. Section 2. Indemnification. Every Director, officer, and Member of the Association shall be indemnified by the Association against all reasonable costs, expenses, and liabilities (including reasonable attorney’s fees) actually and necessarily incurred by or imposed upon him or her in connection with any claim, action, suit, proceeding, investigation, or inquiry of whatever nature in which he or she may be involved as a party or otherwise by reason of his or her having been an officer or Member of the Association, whether or not he or she continues to be such Director, officer, or Member of the Association at the time of the incurring or imposition of such costs, expenses, or liabilities, except in relation to matters as to which he or she shall be finally adjudicated in such action, suit, proceeding, investigation or inquiry to be liable for willful misconduct or gross negligence toward the Association in the performance of his or her duties or, in the absence of such final adjudication, any determination of such liability by the opinion of the legal counsel selected by the Association. The foregoing right of indemnification shall be in addition to and not in limitation of all rights to which such persons may be entitled as a matter oflaw and shall inure to the benefit of the legal representatives of such person. Section 1. Notice to Board of Directors. An Owner who mortgages his or her Lot shall notify the Board of Directors of the name and address of his or her mortgagee, and shall file a copy of the mortgage with the Board of Directors. Section 2. Notice of Unpaid Common Charges. The Board of Directors, whenever so requested in writing by a mortgagee of a Lot, shall promptly report any then unpaid common charges due from, or any other default by, the Owner of the mortgaged Lot. Section 3. Notice of Default. The Board of Directors, when giving notice to a Lot Owner of a default in paying common charges or other default, shall send a copy of such notice to each holder of a mortgage covering such Lot whose name and address has theretofore been furnished to the Board of Directors. Section 4. Examination of Books and Records. The books, records, and papers of the Association shall at all times, during reasonable business hours, be subject to inspection by any Member and any mortgagee of a Lot. The Declaration, Articles of Incorporation, and Bylaws of the Association shall be available for inspection by any Member or any mortgagee at the principal office of the Association, whose copies may be purchased at reasonable cost. As more fully provided in the Declaration, each Member is obligated to pay to the Association annual and special assessments, which are secured by a continuing lien upon the property against which the assessment is made. Any assessments which are not paid when due shall be delinquent. If the assessment is not paid when due, the assessment shall bear interest from the date of delinquency at the same rate of eighteen percent (18%) per annum, and the Association may bring an action at law against the Owner personally obligated to pay the same or foreclose the lien against the property, and interest, costs; and reasonable attorneys’ fees of any such action shall be added to the amount of such assessment. No Owner may waive or otherwise escape liability for the assessments provided for herein by non-use of the Common Areas or abandonment of his or her Lot. Section 1. These Bylaws may be amended, at a regular or special meeting of the Members, by a vote of Members owning two thirds of the Lots, either present in person or by proxy. The fiscal year of tile Association shall begin on the first day of January and end on the 31st day of December of every year, except that the first fiscal year shall begin on the date of incorporation. A. The Cottages at Willett Brook Association, Inc. (the “Association”), acting through its Executive Board, has adopted the following Rules and Regulations (“Regulations”). These Regulations may be amended from time to time by resolution of the Executive Board. B. Wherever in these Regulations reference is made to “Lot owners,” such term shall apply to the owner of any Lot, to such Owner’s family, tenants whether or not in residence, servants, employees, agents, visitors and to any guests, invitees or licensees of such Lot owner, or such Owner’s family or the tenant of such Lot owner. C. The Lot owners shall comply with all of the Regulations hereinafter set forth governing the Development, roadways, driveways, grounds and any other appurtenances. D. Capitalized terms not defined herein shall have the same meaning ascribed to them as in the Declaration of Protective Covenants, Reservations, Restrictions, and Easements of Cottages at Willett Brook, dated January 21, 2015, as amended (the “Declaration”). E. These Regulations may be amended from time to time by the Developer, or consent, waivers or approvals to the Regulations may be granted by the Developer, provided the Developer owns a Lot in The Cottages at Willett Brook subdivision. Thereafter, the Association reserves the right to alter, amend, modify, repeal or revoke these Regulations and any consent, waiver or approval given hereunder at any time by resolution of the Association or the Executive Board. In the event of a conflict between these Regulations and the terms and provisions of the Declaration, the terms and provisions of the Declaration shall control. 1. All garbage and trash must be placed in the proper receptacles designated for refuse collection and no garbage or trash shall be placed elsewhere on the property. However, if a Lot owner chooses to obtain private trash pick-up service, trash may be placed on the curbside in proper receptacles no sooner than the morning of the pickup. 2. All charges and assessments imposed by the Association are due quarterly and payable in advance on the first day of each quarter, unless otherwise specified. 3. No more than one residential building shall be permitted at any time on the Lot, exclusive of auxiliary structures such as a garage or storage building. No modifications to the exterior of the home are permitted without a written request from the Lot owner and without approval from the Developer. 4. No dwelling or other building erected on the Lot shall be covered with tar paper, tarred shingles or other types of tarred siding but shall be covered with clapboards, log siding, shingles, masonry, vinyl or similar suitable material. 5. The property shall be kept in a neat appearance and maintained. No disabled or unregistered vehicles, junk or debris shall be stored or kept in open view on the property. 6. There shall be no additional clearing of any wooded areas. 7. House trailers, or mobile homes, so-called, whether on wheels or not, and tents for occupancy shall not be permitted on the Lot. 8. The Lot shall not be subdivided, but if sold must be sold in its entirety, and subject to the restrictions and conditions set forth herein. 9. Neither the property hereby conveyed, nor any part of it, shall be used for any commercial purposes whatsoever, but shall be used solely for private residential purposes. 10. No animal husbandry shall be housed or kept on the property, provided, however, that this shall not exclude common household pets. If a Lot owner chooses to have a common household pet, there is a two pet maximum with a sixty-five pound limit for each pet. Pit bulls, Rottweilers and German Shepards are not permitted, including visiting dogs. All pet waste, must be picked-up from the Owner’s property and Common Areas and disposed of properly. All pet urination shall be conducted in the Owner’s rear or side yard and not in the Owner’s front yard or Common Area. No dog houses, runners or tie-outs are permitted on the property or grounds. 11. Exterior fencing, flags, lawn ornaments, decorations, hammocks, swings and fountains shall not be permitted on the property or grounds. 12. One (1) bird feeder is permitted if suction cupped to Lot owner’s window or installed as a single-post or double hook yard post. 13. A temporary grill and/or small portable fire pit is permitted but must be stored inside the Lot owner’s home when not in use. 14. Complaints must be submitted in writing to the Association. 15. A garden in the rear of the Lot owner’s home is permitted with approval from the Developer prior to installation. Two small 4’ x 12’ raised beds are permitted with a 2’ path between finished area with bark mulch and filter fabric beneath to control weeds. All raised beds shall not be taller than 20”. No fencing is permitted around the raised beds or in any other areas. All garden beds must be maintained regularly and free of weeds and clutter. Flower boxes and additional flowers or plantings must be approved from the Developer before being installed on Lot owner’s property. One (1) black potted plant “staff or shepherd hook” is permitted on Lot owner’s property. 16. A small deck, patio or screened porch not to exceed 8’ deep x 12’ long or 10’ deep x 10’ long or less, directly against the rear of Lot owner’s home is permitted, however, design and location approval from the Developer is required. Patio furniture is permitted on front porch, screened porch and/or rear porch, patio or deck, but must fit entirely on the designated area. Laundry lines are permitted in screened porch areas only. 17. Homes may be rented to persons age 55 years of age or older for a minimum of one month and up to four times per year. All renters must be approved by the Association and a lease must be submitted to the Association prior to the start of the rental period. 18. The clubhouse may be reserved on a first come first serve basis, scheduled at least one week in advance on the calendar located in the mailroom. The clubhouse must be thoroughly cleaned and replenished after its use.